Teaching English Abroad, Is it Right for Me? 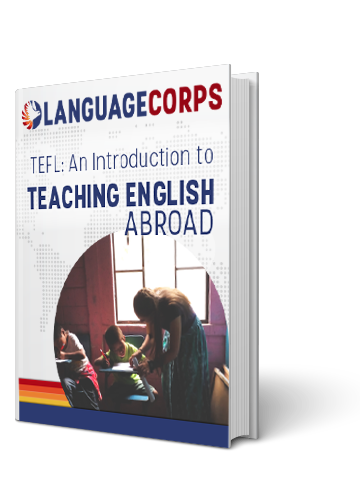 The Language Corps Teacher Profile: Is Teaching English Abroad for me? Do you have an adventurous spirit? Are you willing to learn and adapt to new surroundings and cultures? Do you yearn for a challenging and rewarding career? If you’ve answered yes to any of these questions, then teaching English abroad may be the perfect job for you. Teaching English abroad gives you the opportunity to teach and travel, combining the adventure of a lifetime with a rewarding career path. Getting paid to travel the world while making a positive impact has never been easier. Apply to become a TEFL/TESOL certified teacher and learn more about teaching jobs abroad. TESOL and TEFL stand for Teaching English to Speakers of Other Languages and Teaching English as a Foreign Language, respectively. This certification gives you the information, instruction, and resources needed to find paid employment teaching English abroad. TESOL and TEFL training and certification also gives teachers an organization of resources and services to help with the teaching process. The TEFL certification will qualify individuals to apply for ESL jobs or teaching jobs abroad in areas like Asia, Europe, and Latin America. Let’s say you want to teach English in Latin America. Your TEFL program will begin with an intensive four week training and certification course on location, including 130-150 hours of classroom time, and 6-15 hours of teaching practice with real local students. Upon completion of the course, you will be qualified for paid teaching positions not only in Latin America, but all over the world. Adjusting to your new life and job will be easy with the assistance of our supportive staff. Teaching English abroad gives teachers the opportunity to teach English as a second language while making a positive impact on the community in which they live and work. Learning English is one of the most important things a dis-advantaged person can do to break the poverty cycle, and as a TEFL instructor, you are an essential part of that process. International education jobs are perfect for former teachers as well, because many of the skills necessary to effectively teach English as a second language are inherent in a great teacher. Patience, passion and motivation will go a long way, and it’s a particularly easy transition for a seasoned teacher. But even if you’ve never taught a day in your life, teaching English abroad is great for those looking to gain experience in an educational career, while learning about other cultures and traveling the world at the same time.